The breakup of the Soviet Union and the political and economic changes that transformed the Eastern European nations and other parts of the world in the 1990s created new challenges for the world Jewish community—and new opportunities for JDC to engage in its three-pronged mission of Rescue, Relief, and Renewal. Working together with the Israeli Government, the Jewish Agency, various advocacy organizations, and successive U.S. administrations, JDC helped secure the release of Jews from Ethiopia, Yemen, and Syria. And when Yugoslavia imploded and ethnic hostilities flared there and in other parts of the former Soviet bloc, JDC helped rescue and care for Jews who were in danger or distress. The Ethiopian saga was perhaps the most dramatic, culminating as it did in Operation Solomon, the massive airlift over a 36-hour period of some 14,000 Jews from Addis Ababa to Israel on May 24 and 25, 1991, just as the city was about to come under rebel attack. JDC assisted in the negotiation and planning of that miraculous rescue, which came on the heels of the comprehensive health and welfare program it had been operating for the thousands of Jews who had gathered in Addis Ababa preparatory to making aliyah. At its height, that yearlong program had some 23,000 beneficiaries, and it was made possible by JDC’s prior track record in Ethiopia, where it had been offering nonsectarian assistance in the Gondar region since the early 1980s. JDC later facilitated the emigration of some 6,000 additional Jews from Ethiopia’s isolated Quara region. It also organized programs to boost the health and well-being of the Felas Mora, Ethiopians of Jewish ancestry who were living in poverty in Addis Ababa and Gondar City, awaiting Israeli government processing of their requests to settle in Israel. Equally compelling stories revolved around the 11 rescue convoys that JDC operated from war-ravaged Sarajevo during the 1992–95 war in Bosnia and Herzegovina. 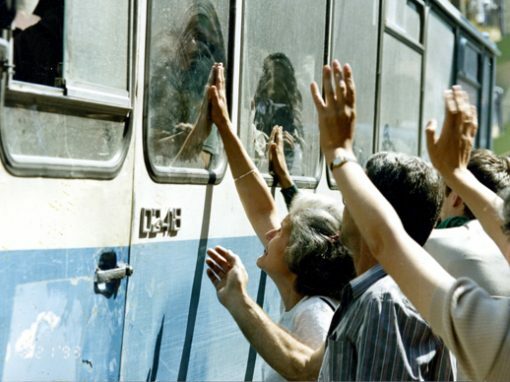 The convoys succeeded in bringing some 2,300 Serbs, Croats, Muslims, and Jews to safety in other parts of the former Yugoslavia and beyond. JDC also supported the Sarajevo Jewish community’s nonsectarian relief efforts in that besieged city, and later in the decade, it helped the Belgrade community assist the many Jews affected by Serbia’s economic difficulties as UN-mandated trade sanctions took a growing toll. In the former Soviet Union (FSU), JDC’s early involvement in a U.S. government food relief program helped it begin to uncover the extent of need among elderly Jews. As the region’s social welfare system unraveled, inflation became rampant, pensions were cut or disappeared entirely, life savings began to disappear, and economic calamity loomed for many in this age group. JDC quickly mobilized a massive support program, helping local communities establish a network of Heseds, or welfare centers, that by January 2000 had succeeded in connecting with and providing various forms of welfare assistance—food packages, hot meals, meals on wheels, home care, and social and cultural activities—for over 190,000 elderly Jews. Many of those Jews were living in conditions of poverty, ill health, and isolation unimaginable to those accustomed to Western standards. Specially equipped vans, called Hesed-mobiles, extended the reach of the Hesed network, and a newly conceived Warm Home program helped combat isolation and was subsequently replicated in Israel and Eastern Europe. The Heseds served also as community-building tools, with community volunteerism encouraged and training provided for both professionals and volunteers. At the same time, JDC refused to be deflected from its original quest to help the Jews of the Soviet Union acquire the knowledge and skills needed to shape an authentic, indigenous Jewish life of their own choosing. By 1999 JDC had helped establish 71 Jewish community centers and 164 Jewish libraries across the FSU; OFEK Jewish book festivals were being organized annually in 76 communities; a family retreat program spearheaded outreach efforts to the unaffiliated; and JDC had become heavily involved in the development of academic Jewish studies programs and adult Jewish education. Leadership development was an important priority, and by the end of the decade JDC was helping operate Hillel centers in 22 cities and had trained 200 local leaders through its Israel-based Buncher Community Leadership Program. In Eastern Europe, as the changeover to a market economy brought cuts in government programs and an increase in the cost of basic necessities, JDC’s life-sustaining assistance for impoverished elderly Jews became more vital than ever. Throughout the decade, JDC continued to facilitate the process of Jewish renewal, helping stimulate the growth of Jewish cultural, religious, educational, and youth activities. Expanding upon an increasingly popular summer camp program begun in Hungary in 1985, the Ronald S. Lauder Foundation/JDC International Summer Camp in Szarvas, Hungary, was established in 1990. Its informal educational program has subsequently helped thousands of Eastern European Jewish youth reconnect to their heritage and their people. JDC encouraged communities to undertake actions that would help them move toward self-sufficiency, and it promoted the development and training of both lay and professional leaders. Leadership training and community building also characterized JDC’s work in Western Europe and Latin America, and by the end of the decade, JDC was beginning to see many of the young leaders trained through its LEATID program take over the presidencies of their communities. Its efforts to bring Jewish communities together were also bearing fruit, with the first-ever European General Assembly bringing 620 participants from 39 countries together in Nice, France, in May 1999, and the seventh Latin American leadership gathering, held in March 2000. A change in Cuban law in 1991 enabled JDC to reenter Cuba, where it helped provide humanitarian assistance—in the form of food, medicines, and medical consultations—and facilitated the resurgence of this remarkable Jewish community. As economic conditions deteriorated in Argentina in the second half of the decade, JDC ramped up its technical assistance to a community already weakened by the tragic bombings of the Israeli embassy in 1992 and the central community building in 1994, helping the community develop new programs to respond to the social welfare needs engendered by the increasing impoverishment of the middle class. JDC’s International Development Program expanded its reach in the 1990s, and the Jewish Coalition for Disaster Relief was created to provide a unified Jewish response to international crises on behalf of U.S. and foreign Jewish agencies. Among the decade’s highlights were relief and recovery efforts for Rwandans ravaged by Rwanda’s civil war, an eye treatment project in Zimbabwe, the initiation of self-help and empowerment programs for women with breast cancer, the establishment of a Middle Eastern health program, training for social service workers in Hungary and Ukraine, reconstruction efforts in Central America following Hurricane Mitch, a comprehensive response to the Kosovo refugee crisis, and earthquake relief and recovery projects in Turkey. In Israel, JDC continued to help the nation find new and better ways to respond to the needs of its most vulnerable population groups. Some 700,000 new immigrants from the former Soviet Union arrived in Israel from 1989 to 1993, overwhelming the absorptive capacities of the nation just as the needs of over 20,000 new olim from Ethiopia needed to be addressed. JDC developed a variety of training and job-related initiatives to facilitate the integration of adults from both groups while concentrating its efforts on helping those in the Ethiopian-Israeli community make the painful adjustment from their familiarity with non-Western environments to Israel’s technologically advanced society. Focusing on the particular needs of Ethiopian-Israeli youngsters, in 1997 JDC initiated the Coalition for the Advancement of Ethiopian Education, with the first PACT (Parents and Children Together) program launched the following year in Beersheva. Fueled by partnerships with North American Jewish federations, PACT subsequently provided preschool enrichment frameworks that have narrowed the social and educational gap between Ethiopian-Israeli youngsters and their veteran Israeli peers in 14 Israeli towns. Program offshoots and additional initiatives have benefited older children and young adults from a variety of immigrant backgrounds. Established in 1998 in response to a sharp increase in child abuse as well as juvenile delinquency and disaffection, JDC’s Ashalim partnership with UJA–Federation of New York and the Israeli government pooled financial resources and professional expertise to pioneer new services on behalf of some 350,000 children and youth at risk of abuse and neglect. Over the next decade, it would develop and pilot over 300 programs for youngsters of all ages and cultural backgrounds. Through its ESHEL partnership with the Israeli government, JDC continued to improve the quality of life for Israel’s seniors, introducing its innovative Supportive Communities model and a new quality assurance program for nursing homes. The needs of Israelis with disabilities were also addressed, and the training programs provided by JDC-ELKA helped improve the overall delivery of human services. At the close of the decade, JDC responded to a government request that it develop a comprehensive program to integrate members of the ultra-Orthodox community into the workforce, thereby foreshadowing the larger, TEVET Employment Initiative that it currently has under way.